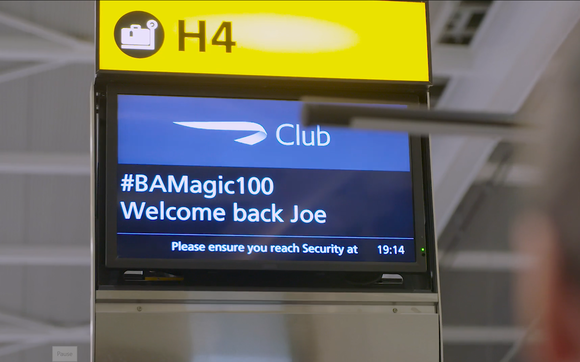 LONDON, UK, 2019-Jan-28 — /Travel PR News/ — British Airways is set to mark its centenary year with 100 acts of kindness as the BA Magic campaign makes a return as #BAMagic100. The campaign, which was launched in 2017, saw the airline arranging surprise proposals, reuniting loved ones, arranging money-can’t-buy experiences and creating holidays of a lifetime. The BA Magic series, which can be viewed here, has generated over six million views on social media. During the initial campaign British Airways stepped in to help a deserving customer, Joe Dowd, on a milestone journey from Heathrow to Dublin in September 2017. Though not a long journey, it was an important one for 47-year old Brentford-based Joe as it was his first flight since he suffered a life-changing brain injury in 2014. His wife, Liz, got in touch with the airline to tell them Joe’s story and to ask for support with his first flight. After a long period of intense rehabilitation Joe defied doctors’ expectations and learnt to walk again, but one of his big goals had been to fly again. Previously a frequent flyer, Joe worked hard to become strong enough to trial taking to the skies again and the couple planned a short flight to Dublin when British Airways stepped in to make the journey as memorable as possible. Joe and Liz had previously lived in Australia, and Joe has decided his ultimate goal would be to make the 10,000 mile journey across the world to visit again one day. On landing at Dublin the couple were surprised by the airline with a pair of tickets to Sydney as an incentive for him to step from one of British Airways’ nearest destinations to the very furthest. In January 2019, 16 months after returning from Dublin, Joe and Liz travelled to Sydney. People can share their stories on Facebook, Twitter or Instagram using our hashtag #BAMagic100. For more information please contact press.office@ba.com. This entry was posted in Airlines, Airports, Business, Festivals and Events, Travel, Travel Marketing, Travel Services, Travelers and tagged Alex Cruz, British Airways, campaign, Celebration, Centenary, Joe Dowd, ‘BA Magic’. Bookmark the permalink.